Barry Bucknell, known as TV's original DIY expert in the 1950s and 1960s has died, aged 91. His son Johnny Bucknell told BBC News Online he died peacefully in his sleep at his home in Cornwall. 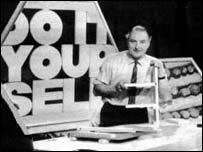 Bucknell passed on his tips in a programme called Do It Yourself, which became Bucknell's House. The half-hour programme was broadcast on BBC TV and was a forerunner to the wide range of homes and interiors shows which fill the schedules today. The programmes were transmitted live from a studio.